A new UFO sighting in Saudi Arabia came just a few days after another triangular flying object was spotted during a thunderstorm. A popular conspiracy theory YouTube channel has recently uploaded an eerie video that shows a bright triangular unidentified flying object (UFO) hovering in the skies of Saudi Arabia. The conspiracy theory channel reveals that the strange sighting in the night skies was shot by a man named Paul Mark Sampaga, and interestingly, the object spotted in the Asian country seems very similar to TR-3B, the alleged secretive military vessel developed by the United States Air Force during the Gulf War. Even though the conspiracy theory channel failed to produce any substantial evidence to prove the authenticity of the video, viewers of the channel believe that this sighting is real for sure, and they argue that something sinister is going on in the skies without the knowledge of general public. It should be also noted that no news channels operating from the middle east have reported the sighting. The triangular object apparently spotted in Saudi Arabia has three unique edges emanating bright lights, and conspiracy theorists believe that these well-cut edges are an indication of its bizarre origin. Most of the conspiracy theorists believe that this UFO might be actually an alien spaceship from deep space. 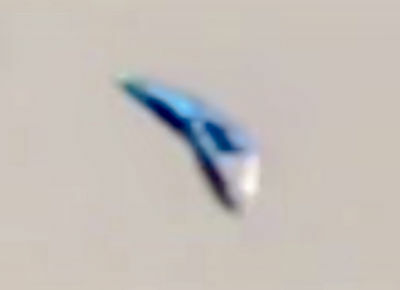 However, a section of other people claims that this flying object could be a secretive military vessel like TR-3B. As per these people, the United States is making use of these flying crafts to spy on other countries. However, sceptics have a different story to tell. Sceptics assure that there is nothing suspicious about these crafts, and they make it clear that the triangular formation could be actually the reflection of lights in the room window. A few days back, Silvano P Colombano, a top NASA expert at the Ames Research Centre had suggested that advanced aliens might have already visited earth. In his study report, Colombano argued that extraterrestrials from unknown nooks of the globe might not necessarily use traditional building blocks of life which is carbon, and he claimed that this might be the reason why they went unnoticed from human eyes. As per Colombano, these aliens might be using sophisticated technology unknown to humans which help them to accomplish interstellar travel.